2018 Update: If you’re looking for basic suits for women, you should check out our updated guide to the best women’s suits of 2018! 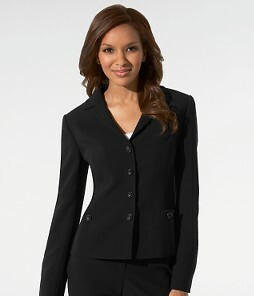 Since interviews are starting, we’ll stick with that theme and show you some great basic suits for women. J.Crew offers wool gabardine and Super 120s wool, which means it’s made with wool yarn that has been twisted more often than regular yarn and is therefore stronger, more durable, etc. Available in both pants and skirts. In our experience, J.Crew clothes tend to fit better on girls who are more straight than curvy. Price range is reasonable, around $300-$400 for a suit. Below: Super 120s Victoria Jacket, available at J.Crew. Ann Taylor has some nice triacetate suits. Yes, they’re polyester, but they resist wrinkling, drape beautifully, and generally wear well. If you’re curvy, Ann Taylor suits may be some of your best bets. They’ve got numerous selections in both pants and skirt suits. N.B. that, in general, a pencil skirt seems more professional to us than an A-line skirt, but work with what looks best on you. Price range is around $325 for both pieces, although you can occasionally find sales of 20-30% off. Be warned, sale shoppers — it’s hard to find all pieces of a basic suit on sale if you wait for it to go 50% or more, so don’t hold off too long. Below: Triacetate Pocket Mid-Length Jacket, available at Ann Taylor. Banana Republic doesn’t offer a skirt suit in the most conservative fabric (whaaa?) but they are great suits that wear well. These also tend to work well on curvy girls. Price range is around $325 for both pieces of a suit. Below: Lightweight wool Classic blazer and trouser, available at Banana Republic. Department store brands – higher budget. Elie Tahari, Theory, Rebecca Taylor, Nanette Lepore, Diana von Furstenberg — all these brands are things that are higher quality than your lower-budget brands, and will cost you $500-$800 per suit. Still reasonable, and if you don’t mind spending the money they will last you a while. Our tip: avoid anything too girly (which may mean Rebecca Taylor and Nanette Lepore are out.) Theory is known for their stretch wools and great fit. (Be warned: their sizing is different than the others. A size 4 in Ann Taylor could be a size 8 in Theory. Oh, bitter pill…) Below: Theory ‘Rory – Tailor’ Jacket from Nordstrom. « Poll: What Color Hose Is Correct For An August or September Interview? Re: sales on Ann Taylor black triacetate. They reuse the same fabric and dye year after year, so if you already own some you can wait for the deep discounts and pick up, say, a different blazer and know that it will match the bottoms you already have. Yes, to second the first comment. You can mix and match pieces from current Ann Taylor lines with past and or future lines because the fabric is all from the same run lot. I have several skirts/pants/jackets that I can mix interchangeably. My one complaint about the triacetate is that it seems to be a magnet for dust, makeup etc. but it generally rubs out pretty easily. Since I already have coordinating pieces, I was recently able to score a new jacket on the sale rack, originally $228, marked down to around $120. As for getting the items on sale, Ann Taylor is great at locating items. If you have an AT charge card, they will search inventory at stores nationally and ship the item directly to your home for a flat charge of $5. I’ve used this several times to complete a suit when I’ve only been able to find half of the suit in the correct size on my local store’s sale rack. I am a diehard fan of the Banana Republic light-weight wool suits. They wear well, are truly year-round despite being wool (more so than triacetate which can get really warm in hot summer weather), and look really polished. Also, at least in the black light weight wool suits, BR usea the same fabric over and over — my black jackson light weight wool pants from Spring 08 (and my martin light weight wool pants from Spring 07 in fact) completely match the Fall 08 lightweight wool jacket. Question for C and the above two posters — do you find triacetate does not require as frequent dry cleaning as wool suits. THe one downside to my BR suits is that they definitely require frequent dry cleanings. I was thinking of trying an AT triacetate suit next time I am on teh market for a suit. Honestly? I’ve had mixed luck with triacetate, mostly on the lucky side. I’ve got a ton of suits from Ann Taylor that really don’t require that much dry cleaning, at all — maybe once every two months. On the other hand, I have at least two suits in triacetate (one of them from AT) where they just CAN’T be drycleaned anymore — they just kind of smell funny. (Sorry if that’s TMI!) I’ve thought about having them re-lined, but since I bought them on deep discount anyway I’m kind of loathe to do that. That’s good to know re: the triacetate. It’s probably gotten better since I bought my last triacetate suit — which was definitely before I went to law school — IIRC that last triacetate was Jones NY in the late 1990s and like you said, the triacetate got to a point of not being able to get it truly drycleaned anymore. That’s also when I stopped wearing sleeveless tops under my suits (ok, now I’m the one saying sorry for TMI). But it really made a world of a difference in the long run, especially when I started buying Jcrew and BR suits. I have to say though, I have sworn off Jcrew now, despite wearing them from 1998 to 2003 — every year the styles got straighter and straighter and they discontinued whatever the curvy persons pants were — BUT the absolute worst: their suits would die on me in like a season. Granted, I often wore them 15 hours a days, but still!!! Anyways, that’s just m two cents. I have friends who have been thrilled with their Jcrew suits which have lasted them at least 4-5 years. I also loved the Ann Taylor triacetate line. As a frequent traveler, the fabric is perfect for pack and wear. However, I bought the AT Signature side zip trousers about 6 months ago (and loved them so much I went back and bought a 2nd pair) but the last couple of months I have noticed small ‘hair like’ fibers all over the pants. It seems to be a major fabric flaw where the spandex is not holding up. If you pull on one, it most certainly is part of the fabric. I’m disappointed because I’ll be throwing both of these pants out as they are unwearable due to appearance.